Ghana is set to experience her first locally and internationally accepted 100% Premium Ghana Cocoa chocolate with the launch of Omama Royal Chocolate on Friday 5th October, 2018 at the Trade Fair Centre. The event which was attended by key stakeholders in the Trade and Industry sector as well as media practioners saw love and affection expressed on faces who had a bite of Omama Royal Chocolate. Omama Royal Chocolate, made from 100 percent premium Ghana cocoa is first non-clothing produced from Nayak Afrik. Mrs Rashidatu Rashida Danso, Executive Director at Nayak Afrik noted that, the company was proud to be contributing to the growth of Ghana’s economy by adding value to local raw material before exporting. She said this was in support of the government’s vision to increase local production and revenue generation in the country as well as promote Ghana to the world. Mrs. Danso said, the chocolate would be sold on the local market as well as on the international market. She said the Omama Royal Chocolate was made from the finest Ghanaian Cocoa, and comes in various sizes and flavours (Omama Royal Milk Chocolate and Omama Royal Dark Chocolate). Nana Agyenim Boateng, Managing Director of Cocoa Processing Ghana (CPC), said his outfit was happy to partner Nayak Afrik in creating a unique brand for chocolate production. He said the chocolate product was of maximum quality and was good for any market. 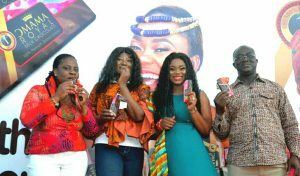 Ms Agnes Adu, Managing Director of the Ghana Trade Fair Company Ltd commended Nayak Afrik for adding Omama Royal chocolate to their product ranges, as they diversify from fabrics and fashion to food and beverage brands. 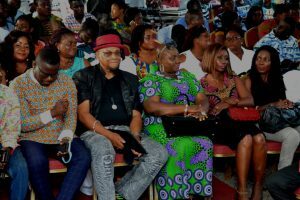 She said her outfit was ready to support any made-in-Ghana product and urged Ghanaians both home and abroad to be ambassadors for the product in their own ways thereby promoting the country Ghana. 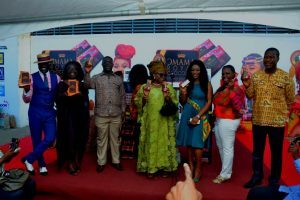 At the event personality and former beauty queen, Akua Amoakowaa was unveiled as the brand Ambassador for Omama Royal Chocolate. Omama Royal Chocolate is currently available on the market. Market Activations and Promotional Activities is set to roll. So where ever you find yourself, grab a bar of Omama Royal Chocolate and have a bite of Happiness.